Constance Michel is an Imperial citizen who works at Honorhall Orphanage in Riften. While the orphanage leader Grelod the Kind mistreats the children with beatings and verbal abuse, Constance is entirely different and takes great pride in making the children feel safe and loved. With Grelod shouting at her and the orphans all the time, Constance's workday is a long one. She sleeps behind closed doors near the dining area until 5am and immediately starts wandering around the orphanage, at times cooking or relaxing on one of the available chairs. At 10am she enters the food storage room and stays there for an hour before she proceeds with her wandering. 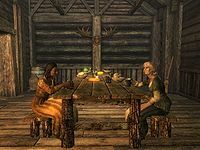 At 3pm, it is time for the children's only meal of the day and Constance will reluctantly take a seat next to Grelod and listen to her complaints for an hour. She spends her evening strolling around as usual until her late bedtime at 1am. There are two exceptions to this routine; when you enter the orphanage for the first time, she will stand in the background while Grelod yells at the orphans. If Grelod is killed, however, she will run around in wild panic, screaming and yelling, while the mistreated children will cheer with joy. Her only possessions are her clothes: a belted tunic and a pair of boots. Her room contains the Pickpocket skill book Purloined Shadows. When approached, it becomes clear that she is terrified that your presence will anger Grelod and she will say, "You really shouldn't be in here." or "I'm sorry, but the children aren't up for adoption right now. You should go." She will also explain her love for the children saying, "My only concern is for the children. The poor darlings have no one else." When exiting conversation she will encourage you to leave with, "If there's nothing else, I really must ask you to leave." After witnessing Grelod's introductory speech to the orphans, you can ask if that is the way of life in the orphanage: "Sadly, yes. Even the townsfolk have taken to calling her 'Grelod the Kind.' Her very existence has become something of a running joke. Grelod runs this orphanage because she's old, and set in her ways, and doesn't know any other life. These children need love, and comfort. I try... But... I'm sorry, you should go. The children aren't up for adoption, and it's cruel to get their hopes up. Besides, Grelod hates... visitors." Her love for the orphans has not gone unnoticed, as the children will describe the differences between Grelod and Constance's way of handling things. Hroar will tell you, "I ain't afraid of the old hag. Still, I wish Constance was in charge. She treats us real good. Constance, sometimes she gives me little snacks. Which is good, 'cause we only get but one meal. Late, too, in the afternoon. I'm a growing boy. I need as much food as I can get." 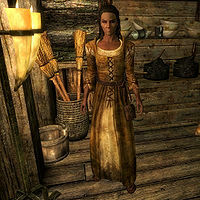 Runa Fair-Shield will, when asked about Grelod, add: "I hate her. Everyone hates her. She's the meanest person I ever met. Sometimes she even locks us in the... room. Constance tries to stop her, and is real good to us, but it's never enough." Constance's sweetness will eventually save her life, as escaped orphan Aventus Aretino specifically requests that Constance be spared, saying, "Please don't kill Constance Michel. She really is kind." When all is said and done and the Innocence Lost quest is completed, Constance will be the only adult in the orphanage and as such, the new leader. The children will be much happier, although Constance will never forget what happened: "I can't believe Grelod is dead. I had no love for the woman, but to be murdered, in cold blood..."
After Hearthfire is installed, Constance will start putting children up for adoption if you've completed Innocence Lost. Constance will ask you what you do, where you live, your name, and which of the kids you want to adopt. If you respond "Harbinger of the Companions", "Arch-Mage of the College of Winterhold", or "the Dragonborn" to what you do, she will initially be disbelieving. If you respond "Thief" or "Assassin", she will ask if it's some kind of sick joke and tell you to come back when you are serious. Esta página foi modificada pela última vez à(s) 20h22min de 3 de outubro de 2014.